I received this from Headline in exchange for an honest review. As always, my reviews are fair and non-bias. It's never been easy for Finley, particularly at home. But two things keep him going: his place on the basketball team and his girlfriend, Erin - the light in even the darkest of his days. Then Russ arrives. He answers only to Boy21, claims to be from outer space, and also has a past he wants to escape. He's one of the best high school basketball players in the country and threatens to steal Finley's starting position. Against all the odds, Russ and Finley become friends. Russ could change everything for Finley, both for better and for worse. But sometimes the person you least expect can give you the courage to face what's gone before ...and work out where you're going next. When I saw The Silver Linings Playbook, I had no idea that it was in fact, a book. 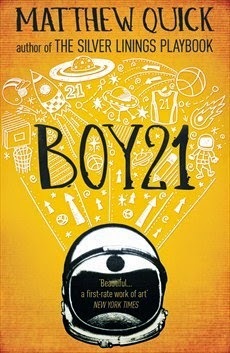 So I was beyond excited for Boy21 to be my first book from the same author as the film I loved so much. Finley loves basketball. It's what his life has revolved around ever since it came into his life when he so desperately needed it. Erin loves basketball too, and their love of the game is what brings them closer. She's now Finley's girlfriend, and they're both about to start Senior year and both want the same thing - to get out of their claustrophobic town - and basketball has a way for them to do that. When Russ arrives, he wants to only be known as Boy21. He's quirky and gives Finley a run for his money in his life on the basketball team and as a character. But what struck me was their fast friendship and understanding of each other. They've both lost things and people and what their newfound friendship gives them each is something they hadn't expected. They find a braveness and backbone that they didn't have on their own, and without knowing, it steers them in the direction of their future in a way they wouldn't and couldn't have imagined. Boy21 captured my attention, my heart and my feelings. It hit me where every good book should, pulling on my heartstrings, but making me laugh nevertheless. It was honest and about a genuine friendship where they didn't have to ask for anything or explain how they felt. They could communicate by knowing each other well, like every good friend does for us, in our actions and expressions. Matthew Quick is swiftly climbing up my favourite authors of the year so far, with Boy21 definitely not going to be trumped for a long time coming. It was a shorter read than usual, just under 300 pages. I read it in one night and when I woke up that morning, it was still there in my thoughts. And that is a five-star book. Not because of it's subjects or themes, but because the story goes far beyond the last page. A quote always does it best. “Someday an opportunity will come. Think about Harry Potter. His life is terrible, but then a letter arrives, he gets on a train, and everything is different for him afterward. Better. Magical." YA Book Lovers (and Adults alike) that love a friendship, or sport-ish themed book. It's a total one-off and I can't think of anything to compare it to, but it reminds me of the feeling you get when you finish a John Green book. Tell me in the comments or on twitter!